October 11, 2013—Humpback whales are known for their unique feeding behavior—called bubble—netting-at the water's surface. 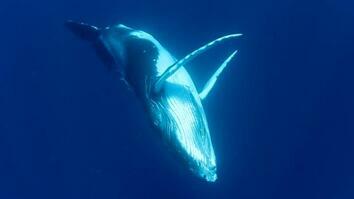 But researchers noticed the whales also spent a lot of time on the bottom. By mounting cameras on the animals, researchers saw for the first time that these whales were bottom-feeding. A group of biologists studying Humpback whales at the Stellwagen Bank National Marine Sanctuary invited the Crittercam team to join them in their research. Crittercams are small, computer-controlled camera system that we use to study animal behavior in their natural environment. The Crittercam is on a suction cup mount at the end of this long pole. Boom...it is attached. 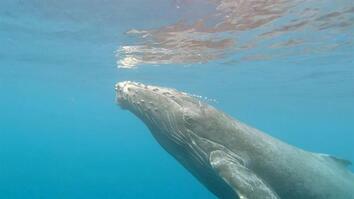 So now you're seeing the view of a humpback's world riding on his back. So, the researchers have put 3D motion tags on whales here and they gotten records of this odd, twisting rolling behavior that is happening well below the surface where they can't see. But they're not really sure what it is. They're thinking it's probably feed of some sort. But they can't be certain. Now by using the Crittercam, we can figure out what's really going on. Is it feeding like they thought or is it something else completely? The Crittercam is on and we're getting this great view of what the whale is doing. And here it begins to go up to the surface to get a breath. And as it does, it run into this other whale. [Crashing noise] And the Crittercam gets caught in between the two and it almost gets knocked off its mount. You can see the front bracket get in the shot now, but luckily bracket held and the camera stayed on. As the whale dives towards the bottom, it gets a lot darker so the camera is kind of straining to see in this low light. And here we actually enhanced the image so we can see the detail better. And it gets a bit grainy. You'll come in and you'll see the whale rotate as it approaches the bottom, it is rolling on it's side and the camera twists so it actually is point downwards. And you see these little sand lance fish swarming all over the bottom. That's the prey that the whale is going after. But they're not actually buried. And so the whales are skimming right along the bottom of the see, but they're not actually digging into it. This bottom feeding behavior go be sometimes done by a whale by itself and sometimes multiple whales working together. And that's the level of detail that the visuals can give us that some of these other devices can't. This next shot is just fun! 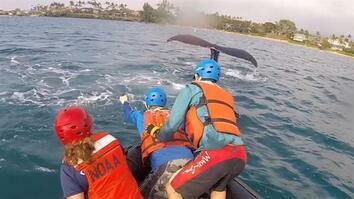 While the whale is wearing the Crittercam it breached. It leaped right out of the water, crashing back down. This is pretty cool to watch from outside the whales perspective but to see it like this just amazing.